The Antarctic continent, roughly the size of the United States and Mexico combined, is composed of rock covered by glaciers some 16,000 feet thick. 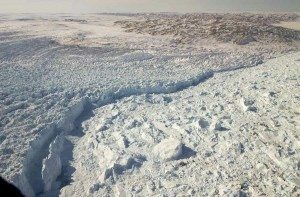 The glaciers form from fallen snow compacting into successive layers of ice, and they eventually move downhill toward the coasts and “calve” into the ocean as icebergs and eventually melt out into the sea. Antarctica and Greenland combined hold about 99 percent of the globe’s freshwater ice. According to the National Snow & Ice Data Center, the result of the entire Antarctic continent melting out completely would be sea level rise of about 200 feet around the world, which could in turn lead to untold devastation. While no one can be sure how hot things will get as a result of global warming, most climate models don’t forecast conditions hot enough to cause the wholesale melt-out of Antarctica. In fact, the British Antarctic Survey (BAS) reports that the East Antarctic Ice Sheet, which constitutes about two-thirds of the world’s southernmost and iciest continent, is remaining relatively stable, with some slight melting that is balanced out by new winter snows. Because East Antarctica rests on rock that is higher than sea level, it is unlikely to collapse. In fact, East Antarctica’s ice cover may thicken moving forward due to predicted increases in snowfall amounts over the coming decades. But on the west side of Antarctica, ice across an area roughly the size of Texas called the Amundsen Sea Embayment (ASE) is already thinning rapidly in large part as a result of surrounding waters warming up due to changing ocean circulation patterns. Many scientists believe that these ocean changes are happening as a result of human-induced global warming as well as thinning of the stratospheric ozone layer. Meanwhile, researchers from NASA and UC Irvine studying the ASE ice sheet report a “continuous and rapid retreat” of glaciers there and think that there is “no [major] obstacle that would prevent the glaciers from further retreat.” They worry that within a millennium and perhaps as soon as two centuries, the ASE could melt out entirely—leading to between four and 10 feet of sea level rise around the world—if moderate warming models prove to be correct. Of course, we can all play a role in preventing such scenarios by reducing our carbon footprints. Take fewer airplane trips. Buy organic food. Walk, bike or take public transit to work. If you must drive, get a hybrid or electric car. Wear a sweater instead of turning up the heat. And urge legislators to push new laws that limit greenhouse gas emissions by industry, utilities and other big polluters. It may be now or never.